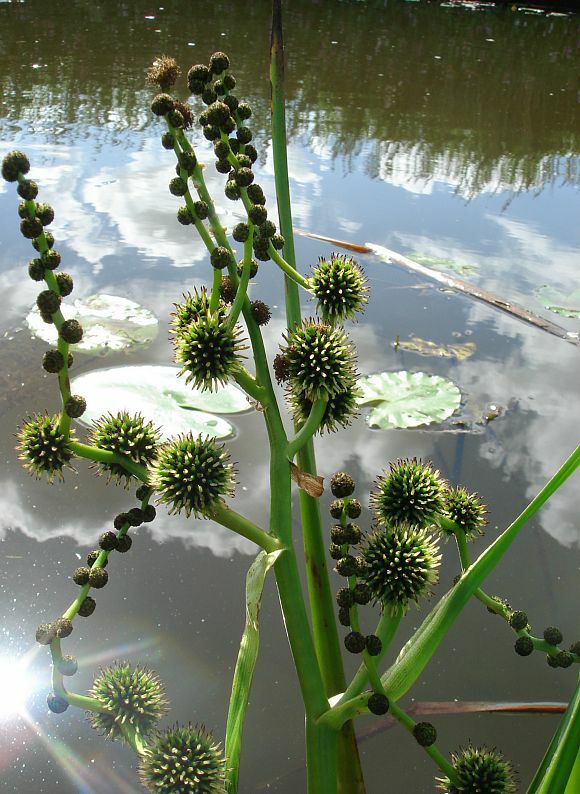 Leaves long, linear, up to 1.5m tall, very strongly keeled for rigidity and much longer than the inflorescent stalks. 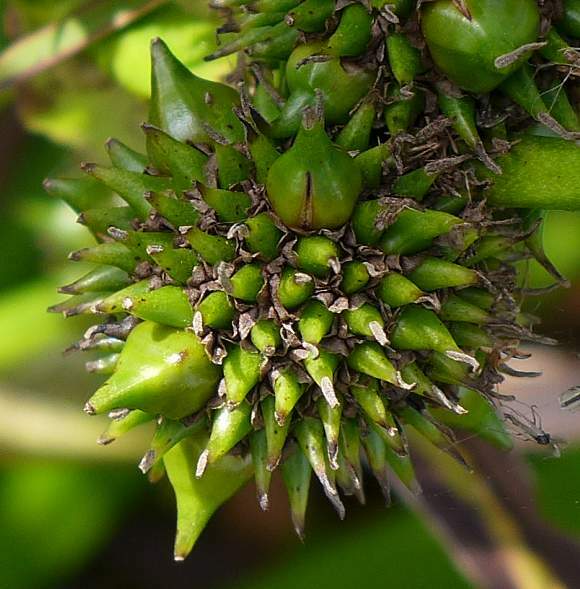 Flowering spikes largely hidden by leaves. Strongly curved leaves emerge from the armpits of each branch, which are alternate. 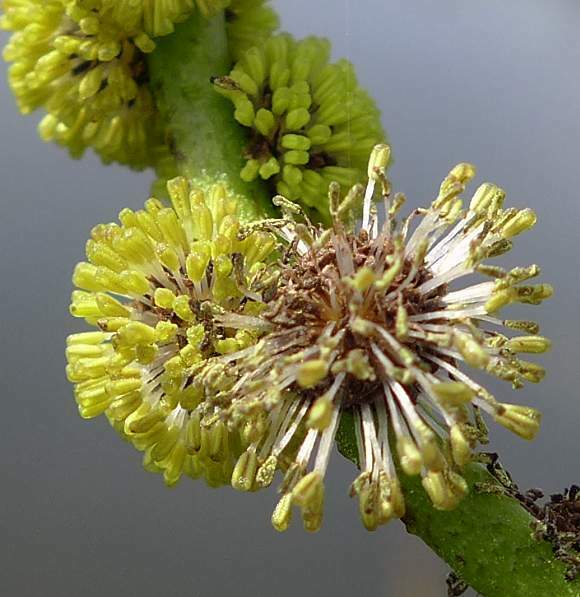 Numerous and smaller male flowers at the ends of each branch; female heads larger and much fewer in number. Smaller male heads cover summit of each branch, larger female heads (in fruit) lower down. Female flowers with white styles/stigmas protruding. Male flowers at the top out-numbering female flowers beneath them. 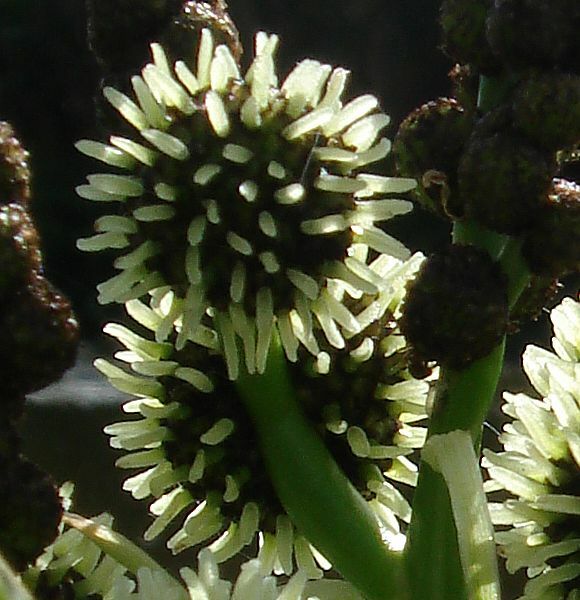 Male flowers open from the bottom upwards, those at top being the last to open. Topmost male head yet to flower, those below in various stages of flowering. Uppermost male flowers still to sprout stamens(?) The right-most one may have anthers starting to protrude(?). The long white stamens of the male flowers with creamy-yellow anthers, the ones on the right finishing and dropping off. 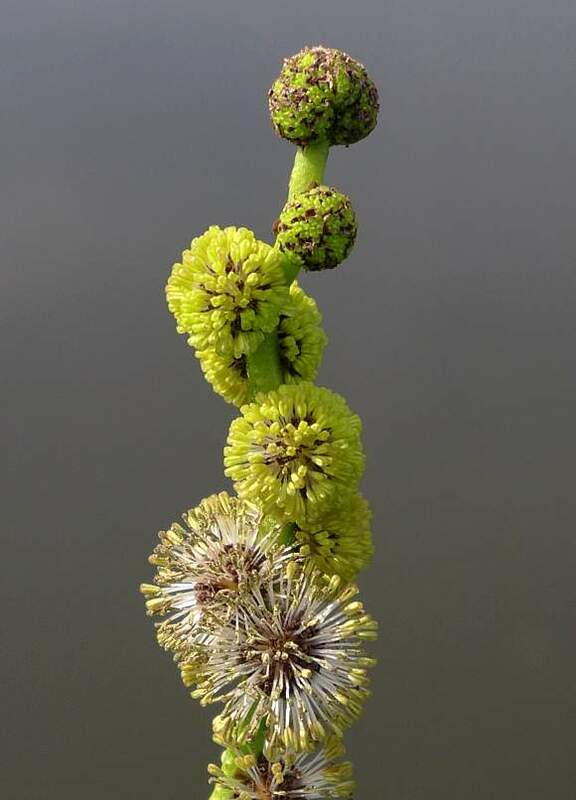 The long filaments and long cream-coloured anthers of Meadow-rues, especially the largest, Common Meadow-Rue, resemble the male flowers of the aquatic Bur-reed plants such as Branched Bur-reed and Unbranched Bur-reed. However, that is as far as any resemblance goes, they are otherwise totally different. 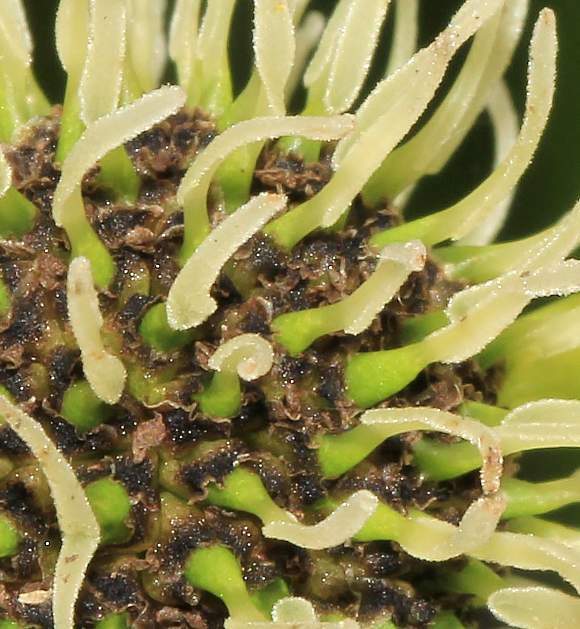 Eventually the stamens and anthers on the male flowers all drop off leaving micaceous-looking silvery brown scales. The long white sinuous stigmas attached to green stubby conical styles. Each green stigma bears just one white style. 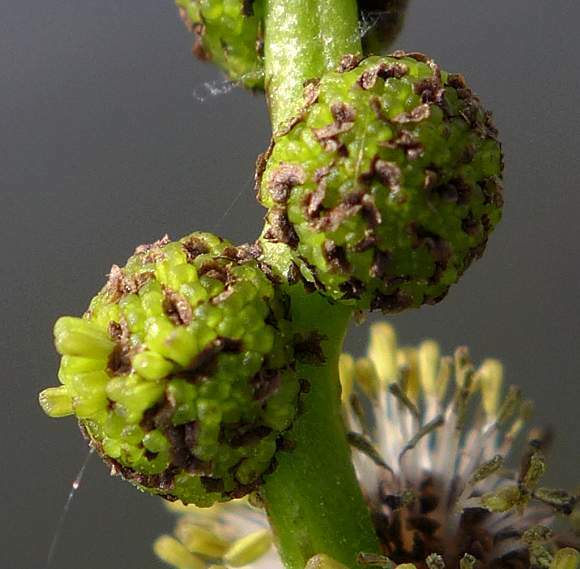 Female flowers at fruiting stage, the long white stigmas having withered to short brown stumps atop the green now-enlarging styles, which are becoming the fruit. 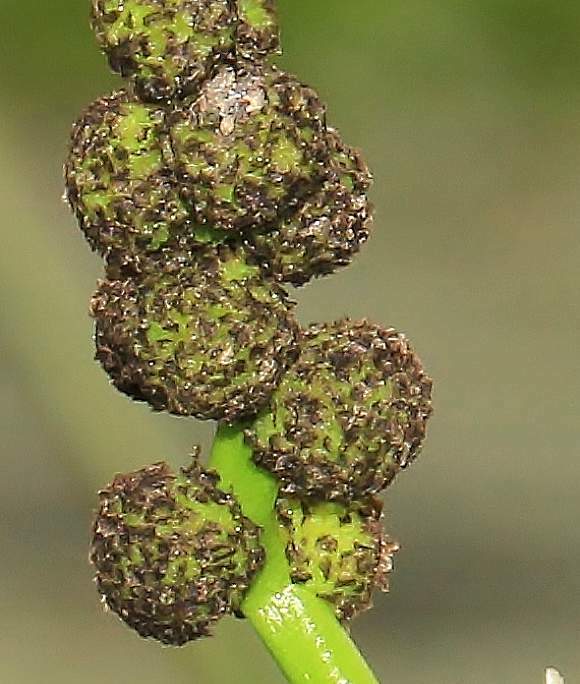 A globular cluster of individual fruits of the female flowers, they are beaked. Some fruits are much larger than others, perhaps only those have been fertilised? Eventually the male heads at the top fall off leaving the fruits of the female flowers still developing. 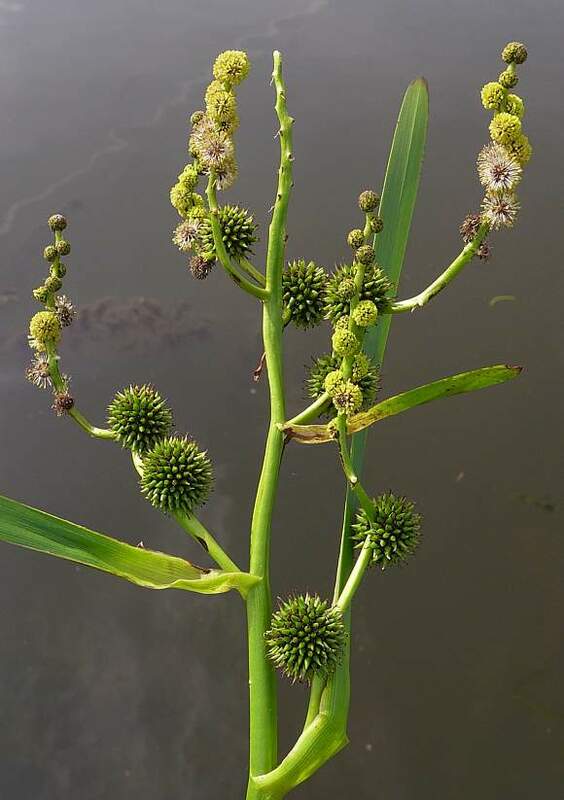 Un-branched Bur-reed (Sparganium emersum), but that is without branches on the stem and is only half the maximum height, 60cm. 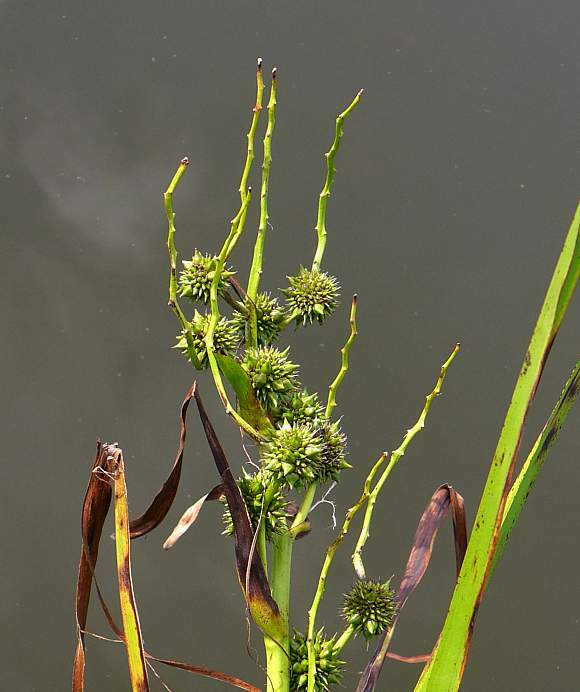 The similarly short (up to 60cm in length) Floating Bur-reed (Sparganium angustifolium) but that has floating leaves and only two male flowers and between 2 and 4 female flowers, and it prefers shallow peaty acidic waters. 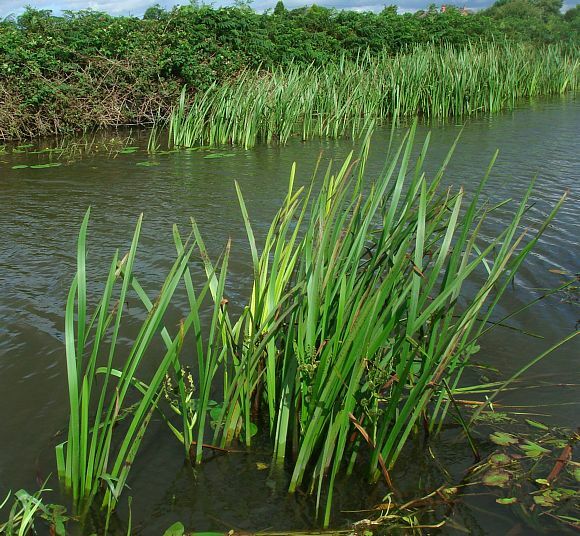 The shortest at just 30cm Least Bur-reed (Sparganium natans) which has but one male flower with narrower (2-6mm) leaves. May also grow in alkaline waters. Not to be confused with : Bur-Marigold s such as London Bur-Marigold or Nodding Bur-Marigold [plants with similar name from a different family]. 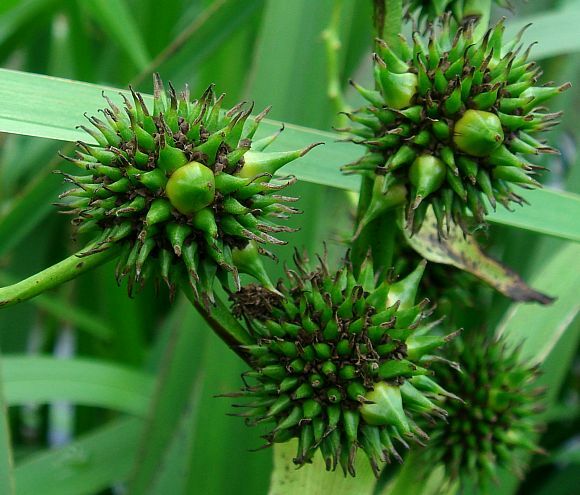 The Genus Sparganium [which was the sole member of the Bur-Reed (Sparganiaceae] Family) has more recently been found to more closely match the Family Typhaceae, which is to where the Sparganiaceae Family has now been subsumed. 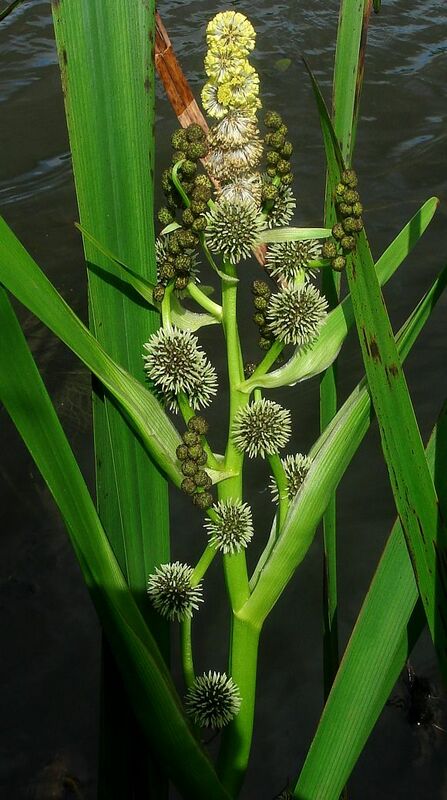 Branched Bur-reed (Sparganium erectum ssp. erectum) - Central & Southern Britain & IOM. Fruits often dark-brown and flat-topped apart from the beak in the centre. 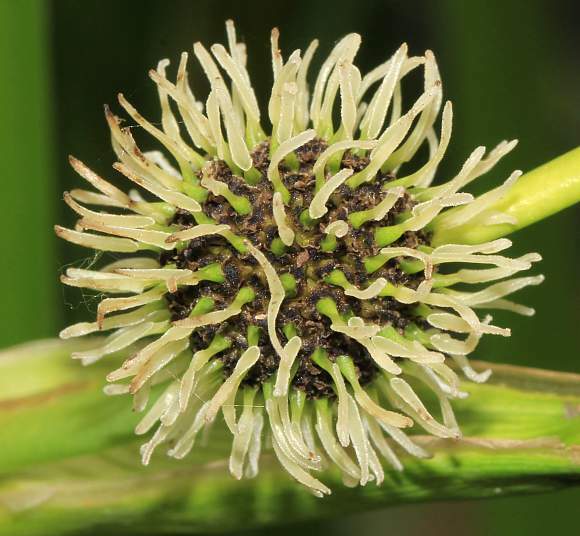 Branched Bur-reed (Sparganium erectum ssp. microcarpum) - All Britain, Ireland & IOM. Fruits often dark-brown at apex with rounded top which narrows abruptly to a beak. 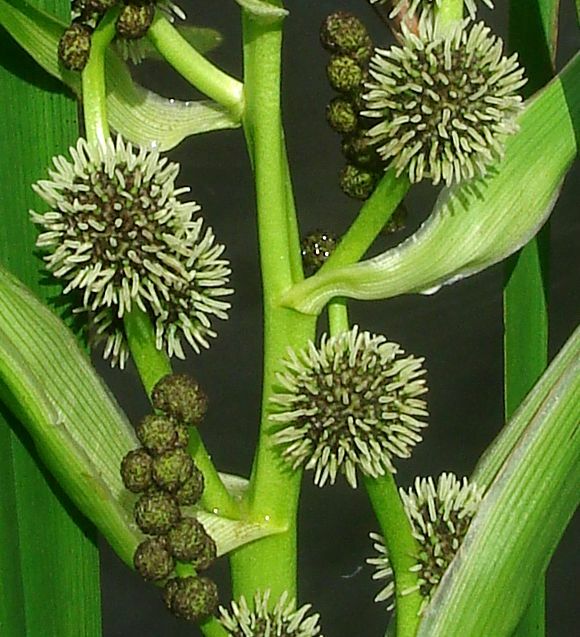 Branched Bur-reed (Sparganium erectum ssp. neglectum) - Throughout Britain & Ireland. Fruits pale-brown, ellipsoidal, only gradually narrowing to a beak. 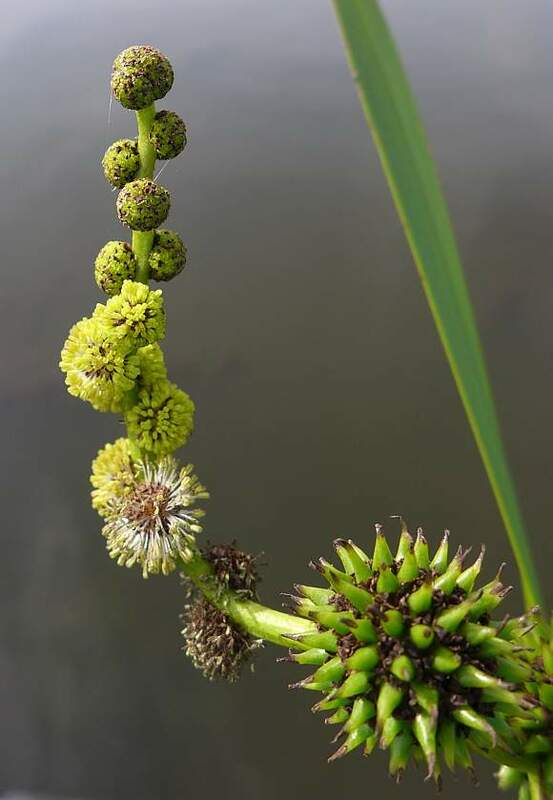 Branched Bur-reed (Sparganium erectum ssp. oocarpum) - [R] The dominant sub-species. Fruits pale-brown nearly globular and abruptly narrowing to a beak. Usually very few fruits form per head. This is possibly the hybrid between ssp. erectum and ssp. neglectum.